James Patterson's middle school novels are a huge hit at Emerson--kids find them funny, relatable, and engaging. Patterson has long been committed to inspiring kids to read -- I'm a big fan of his Read, Kiddo, Read website and the way he uses his notoriety and success to champion all sorts of reading for kids. "Here's a simple but powerful truth that many parents and schools don't act on: the more kids read, the better readers they become. The best way to get kids reading more is to give them books they'll gobble up... Freedom of choice is a key to getting them motivated and excited." 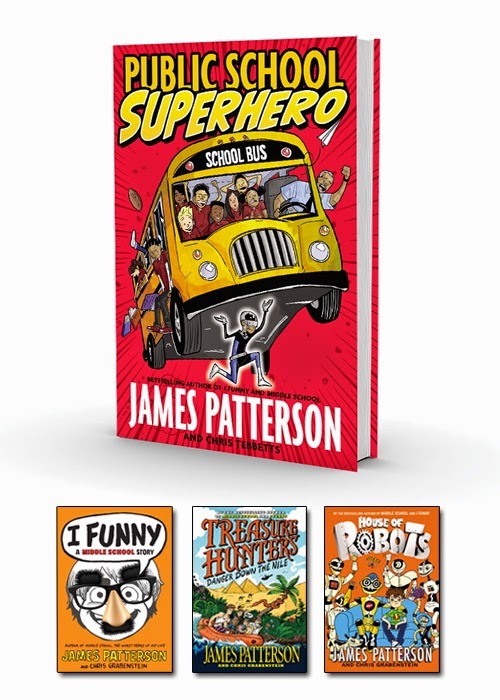 Patterson has just announced a tremendous opportunity he's offering to schools across the US: he's pledged $1.5 million to give to school libraries through a partnership with Scholastic. Please share this news with your school librarians, principals and teachers! Today I'd like to celebrate his newest book: Public School Superhero. I'm excited about this because so many of my 4th and 5th graders ask for funny books and adventure books. They will love the comics that are sprinkled throughout this. And I'm so happy to see the main character is an African American boy. Publisher summary: Kenny Wright is a kid with a secret identity. In his mind, he's Stainlezz Steel, super-powered defender of the weak. In reality, he's a chess club devotee known as a "Grandma's Boy," a label that makes him an easy target for bullies. Kenny wants to bring a little more Steel to the real world, but the question is: can he recognize his own true strength before peer pressure forces him to make the worst choice of his life? This book giveaway is open to participants in the US only. Prizing & samples courtesy of Little, Brown and Company. The review copy was kindly sent by the publisher, First Second. If you make a purchase using the Amazon links on this site, a small portion goes to Great Kid Books. Thank you for your support. 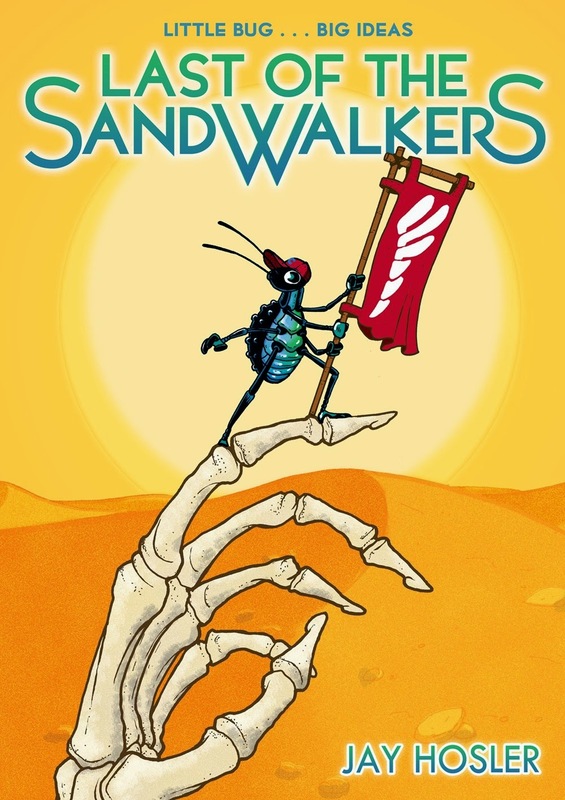 Jay Hosler's new graphic novel The Last of the Sandwalkers is not going to grab everyone, but for the right audience it is absolutely terrific. You're going to love it if you like comics, science, adventure and humor. Hosler drops readers into the middle of the age of New Coleopolis, the world of beetles where nothing exists beyond their protected oasis. You see, Old Coleopolis was destroyed over 1,000 years ago when the god Scarabus obliterated it with a barrage of coconuts. And yet Lucy, an intrepid young researcher (the sandwalker beetle from the title), is sure that life exists beyond the oasis. Lucy sets out on an epic quest to prove that life exists in the great world beyond. She is accompanied by Raef, a pun-loving firefly, Professor Bombardier, the wise level-headed elder of the group, and Mossy, a giant Hercules beetle. One disaster strikes after another, as Lucy and her friends confirm their hypothesis and then try to make their way home. Ajani, an Emerson 5th grader who's avidly read science nonfiction as well as all types of comic books for years, started off our conversation about this saying, "I wish they'd make another one." Ajani's favorite character is the firefly Raef. Hosler's humor is sophisticated, layered and yet totally accessible. Ajani loved that the Dyna-soars were birds (they'd look like giants if you were a beetle! ), and he definitely got the reference to birds being descendants of dinosaurs. But he also picked up on Raef's character traits, protecting himself and his friends out of steadfast loyalty. Lucy & friends try to escape from the "Dyna-soars"
Hosler, a biology professor at Juniata College, weaves scientific information throughout the story, but this just adds to the wonder and fun of the adventure. 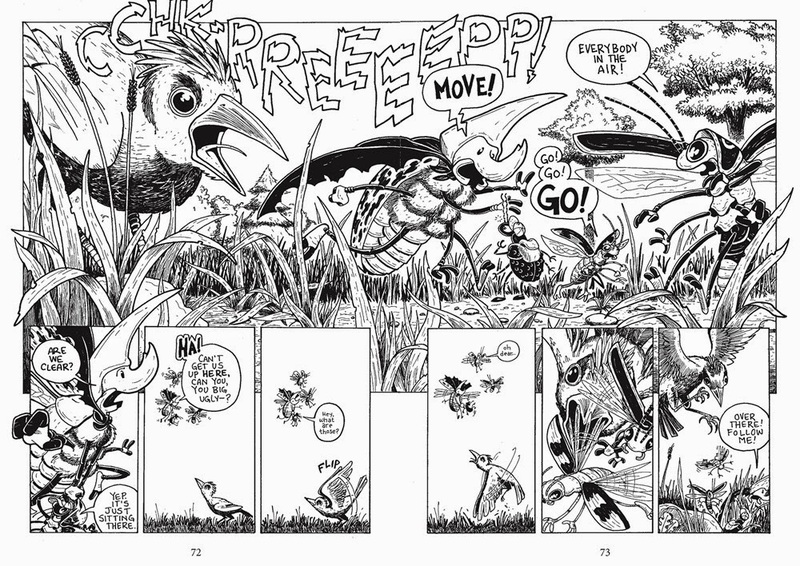 As he states on his website, his goal "is to use the compelling visual power of comics to illustrate the alien worlds that often go unnoticed and unappreciated." My favorite character is Professor Bombardier, so I was thrilled to have Hosler visit for this blog tour and tell us a little more about the Bombardier beetle. Color: Mostly dark brown elytra with orange/broan markings. Many beetles are capable of storing nasty chemicals in their body and secreting them as a means of deterring the unwelcome attention of predators. The pioneering chemical ecologist Thomas Eisner talks about many of them in his book Secret Weapons. 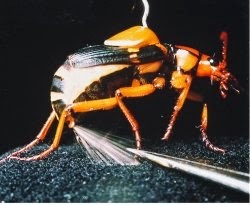 The bombardier beetle, however, is probably the most impressive. It has two reservoirs in its abdomen that contain reactive chemicals. When it is disturbed, it releases the chemicals into another chamber that is lined with enzymes. These enzymes initiate a series of chemical reactions. The result is the build up of a blazing hot, extremely irritating concoction that the bombardier beetle can spray at any nuisance that gets on its nerves. 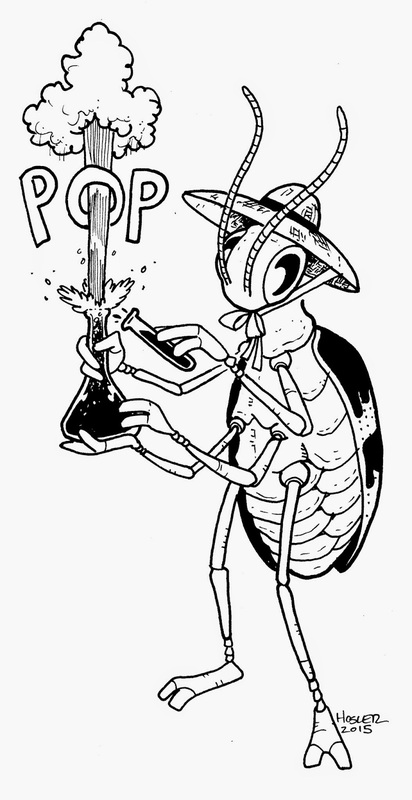 Whipping up such a nasty elixir qualifies the bombardier beetle as a world-class beetle chemist, but it’s also quite a marksman. There is a tiny turret at the tip of a bombardier beetle’s abdomen that it can aim in 360 degrees. When sufficiently annoyed, these beetles will spray their calamitous cocktail in a series of short pulses. A steady stream of chemicals could be hazardous to the beetle’s health. The turret actually cools slightly between pulses and this prevents the beetles from cooking their own abdomen. Sounds far-fetched, I know, but don’t take my word for it. Sir David Attenborough will show you the whole amazing display in this video. The bombardier beetle has also rubbed elbows with some of the great scientists of our time. Charles Darwin even mentions one in his autobiography. Apparently, he was out collecting beetles when he came across a particularly fascinating specimen. Unfortunately, he already had a beetle in each hand. Undaunted, he popped one of those beetles in his mouth for safe keeping so that he could pick up this third specimen. Much to his dismay, he quickly learned that the beetle in his mouth was a bombardier and the repellent experience distracted him so much that he lost all three beetles. In Last of the Sandwalkers, Professor Bombardier plays an important role as the guiding hand of our team of intrepid explorers. But don’t be fooled by her patient, genteel demeanor. Threaten her friends and you just might be on the receiving end of a scalding chemical scolding. Many thanks to Jay Hosler for sharing such a terrific story and great background information. I know this is a graphic novel that my science-loving, comics-fans will read again and again and again. Make sure to stop by each of the post for The Last of the Sandwalkers blog tour. Hosler will share information about different characters at each. The review copy was kindly sent by the publisher, First Second. If you make a purchase using the Amazon links on this site, a small portion goes to Great Kid Books. Thank you for your support. Pam Muñoz Ryan captivates readers with this multilayered story set around the tumult of World War II. Themes of hope, resilience and inspiration echo (yes, pun intended) throughout three different characters' separate stories, set in Germany, Pennsylvania and California in the 1930s and 1940s. Already, my students are raving about this, telling each other that it's one of the best books of the year. Ryan's story is framed by a short fairy tale that introduces themes carried through the whole book. In this tale, young Otto started to read a magical story that suddenly comes to life -- in which the spirits of three cursed princesses are carried in a mystical harmonica. They will only be free if the harmonica can save someone on the brink of death. The story then shifts to 1933 in Germany, where young Friedrich struggles to survive in Nazi Germany, dealing both with a birthmark on his face and an intense love of music, especially the harmonica. Ryan not only shows the conformity insisted upon by the Nazis, but also the risks people took to stay true to their ideas and passions. Through Friedrich, readers really feel the power of music to inspire and fill a person's soul. Friedrich works in a harmonica factory with his father and discovers the magical harmonica that Otto leaves behind. The chapter ends on a cliff-hanger as Friedrich tries to rescue his father from a Nazi prison camp. "I liked how the author changed stories right as you were about to get bored with one story--I really liked how it was a total fairy tale in the beginning, and then suddenly changed to the beginning of WW2. I like how one object connects all the stories -- the harmonica." Next, the harmonica travels to Depression-era Pennsylvania, where it is given to two brothers, Mike and Frankie Finnegan, in an orphanage. Once again, music plays an important role in their lives--both as a connection to their mother who taught piano lessons and to a wealthy woman who adopts them but doesn't seem to want them. 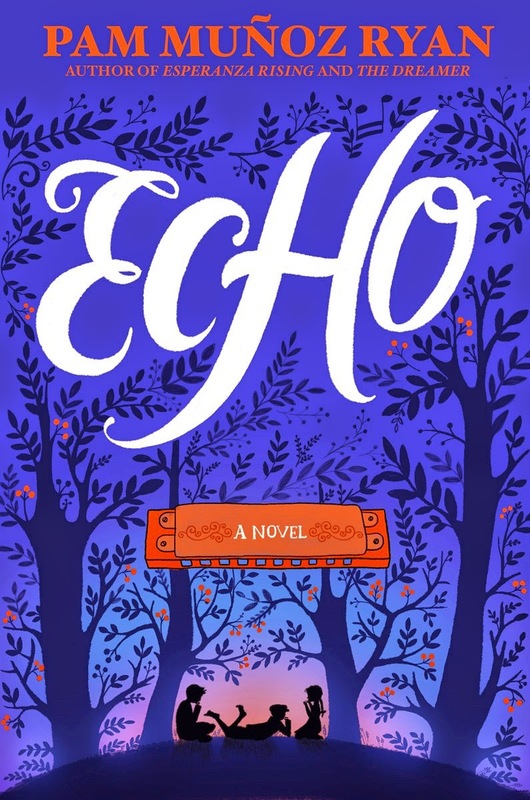 The final chapter is set in Southern California, where Ivy Lopez learns to play the harmonica and discovers she has exceptional musical ability. Ivy, the daughter of Mexican-American migrant workers, must confront segregation and discrimination. The final chapter ties all of the stories together, as the characters meet in New York City in 1951 at a grand performance in Carnegie Hall. Several students commented that this chapter was confusing in the way Ryan jumped back and forth in time as she wrapped up each story. Even so, this is a story that they are recommending to one another with great enthusiasm. 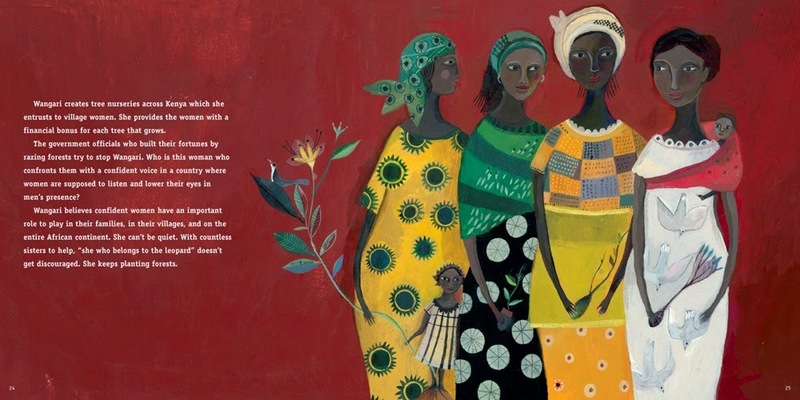 We celebrate Women's History Month each year, reading picture book biographies, investigating women through online sources and talking about women in our community. 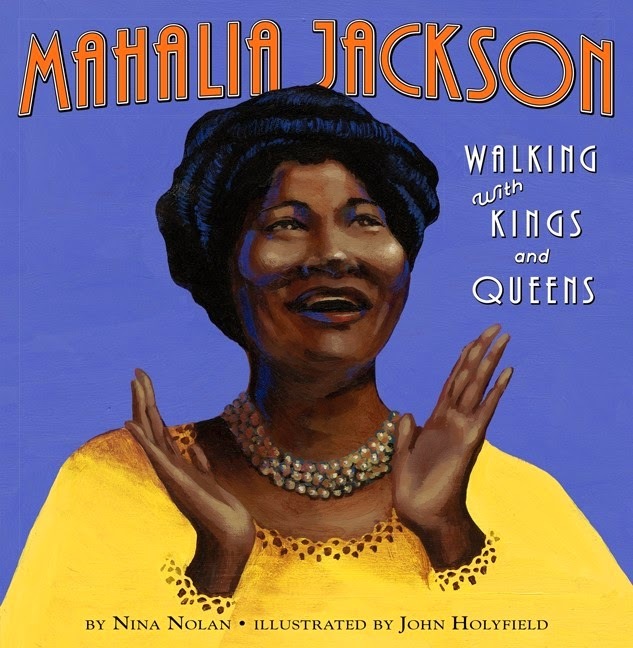 I'm happy to share today two new picture book biographies of inspiring African American singers, gospel singer Mahalia Jackson and opera singer Leontyne Price. "People might say little Mahalia Jackson was born with nothing, but she had something all right. A voice that was bigger than she was." Although she was surrounded by all types of music in New Orleans and Chicago, Mahalia found comfort singing in church--especially given the hard times she experienced as a child. Nolan especially emphasizes Jackson's determination to pursue her singing and stay true to herself and her passion for gospel. "Mahalia sang for as many people as she could. She knew gospel lifted people up. And when you know something like that, you've got to tell it to the world." This is an important addition to our collection of picture book biographies. Pair this with Andrea Davis Pinkney's Martin and Mahalia: His Words, Her Song. 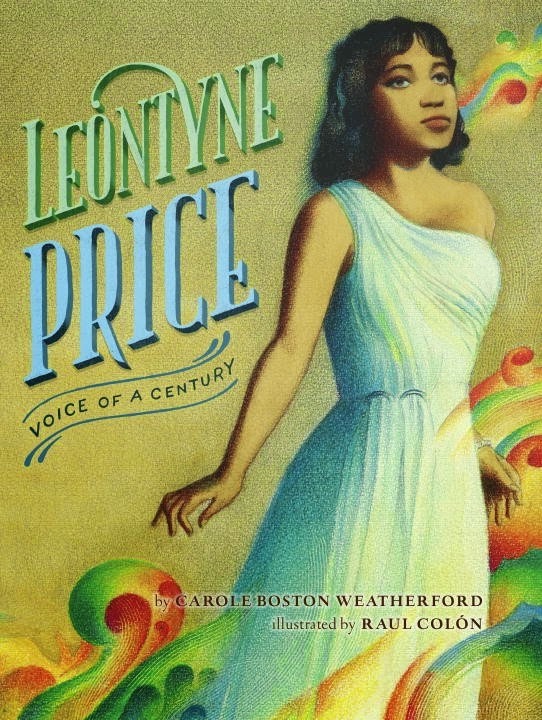 I adore the beauty and strength in this new biography of opera singer Leontyne Price. Weatherford clearly introduces Price's life, showing how difficult it was for her to pursue singing as a career. Leontyne's family supported her passion for music: "Their song of encouragement rose above the color line." But it was Marian Anderson, the African American opera singer who gave a famous performance on the steps of the Lincoln Memorial in 1939, who truly inspired Price. Art songs and arias, shaping a brown girl's dreams." Weatherford's language is poetic and beautiful, yet always simple enough for young students to understand. "Leontyne was never more majestic than as Aida, playing the part she was born to sing... Standing on Marian's shoulders, Leontyne gave the crowd goose bumps. The song of her soul soared on the breath of her ancestors." Raul Colón's soft watercolor illustrations capture Price's grace and grandeur, while still feeling personal. An inspiring combination of text and artwork that draws children to it right away. 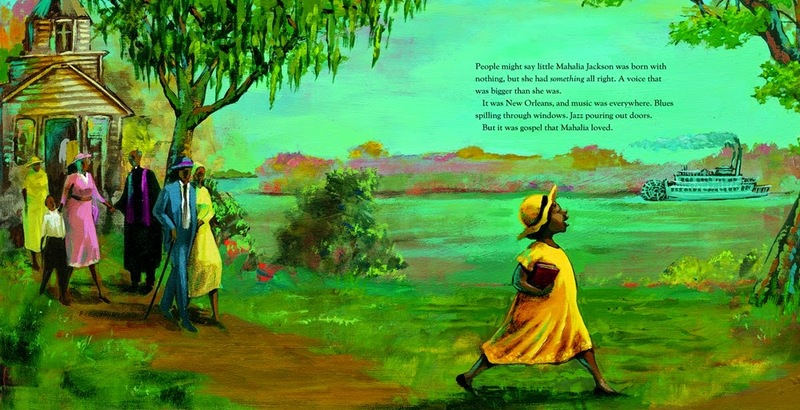 Mahalia Jackson illustrations ©2015 by John Holyfield; used with permission from HarperCollins. 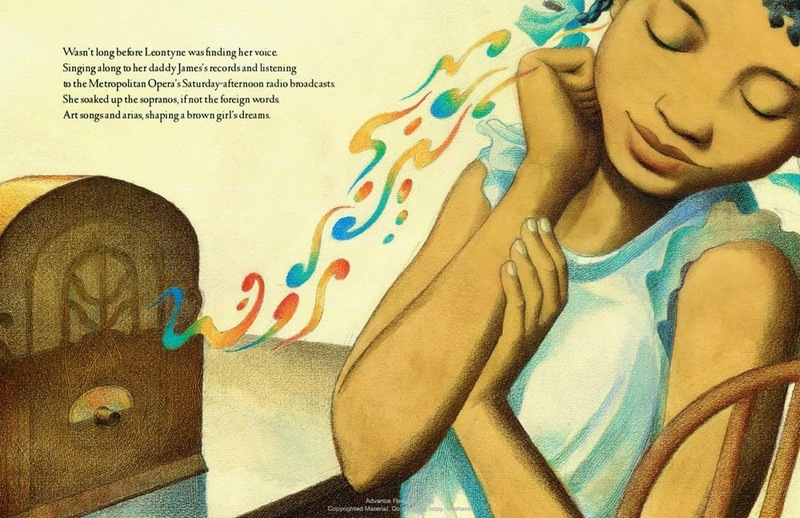 Leontyne Price illustrations ©2015 by Raul Colón; used with permission from Random House. The review copies were kindly sent by the publishers. If you make a purchase using the Amazon links on this site, a small portion goes to Great Kid Books. Thank you for your support. Did you know picture books are not just for little kids? Do you love picture books with all your heart? My students and I do--they make us smile, they make us want to share books with friends, and they draw us into reading them again and again. Last week we had a terrific visit with artist & author Lisa Brown. Our kids were fascinated with the books she shared--hers and many other favorites--and had so many questions for her. If you have the opportunity for an author visit, I highly recommend bringing Lisa to your school. All month, we've been talking about noticing details in picture books, especially around characters. Our 3rd and 4th graders have been identifying how characters feel, and then explaining the details that they notice to support their ideas. In art class our students have been drawing cartoon figures with different expressions, putting into action what they've been noticing in their reading. Just look at this detail from Molly Bang's When Sophie Gets Angry: Really, Really Angry. A 3rd grader wrote: Sophie is "angry and jealous"-- look at "her hair is up, eyebrows down sloping, shouting." Supporting their opinions with this type of clear details is just the sort of practice that they need when they start writing literary essays. 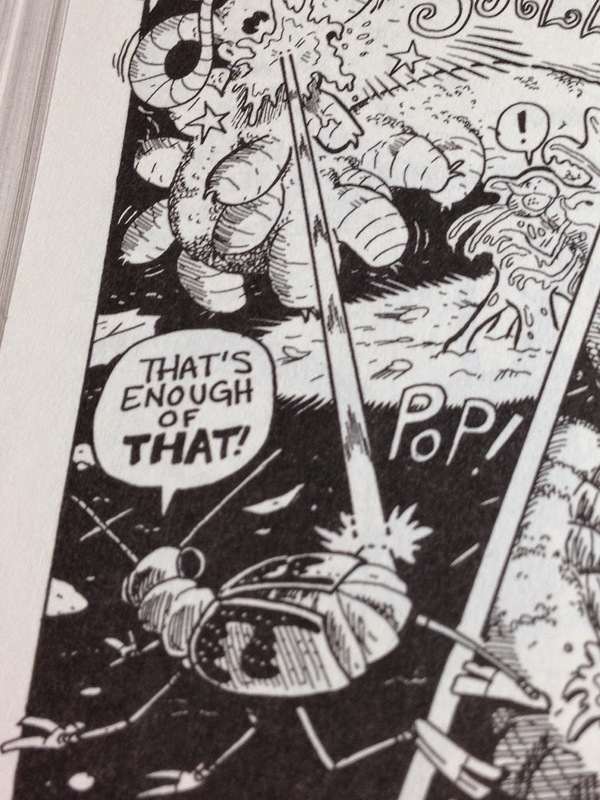 But even more importantly, in my opinion, it helps them read carefully and empathize with characters. Another pair of 3rd graders loved sharing A Ball for Daisy, by Chris Raschka. Our students worked on developing descriptive words for character's emotions -- not just saying that Daisy was sad, but that she was "depressed, melancholy, unhappy." I just love this example from Mo Willem's Goldilocks and the Three Dinosaurs, where students described the mother dinosaur as "sneaky, tricky and mysterious." Lisa started off her presentation by sharing picture books that make us feel like we're going on a treasure hunt. Kids know Where's Waldo, but books like Benjamin Chaud's wonderful The Bear's Song incorporate this treasure hunt into the essential plot of the story. We had great fun looking at Lisa's recent books Vampire Boy's Good Night and Emily's Blue Period, noticing the details she used to add depth and meaning to the story. We had already read these stories before her visit, so students loved showing her the details they had already noticed (the butler has a bandaid on his neck!) and hearing about others that helped us see more into the story. Finally, Lisa shared her sketchbook--explaining how she draws every day. And she celebrated drawings our students had done, sketching all sorts of emotions and expressions. Sending out huge thanks to Lisa Brown for taking the time to visit, and to the Berkeley Public School Fund and the Emerson PTA for sponsoring this author visit.If you make a purchase using the Amazon links on this site, a small portion goes to Great Kid Books. Thank you for your support. Wangari Maathai won the Nobel Peace Prize in 2004 for her work helping women throughout Africa planting trees to improve the environment and their quality of life. As we celebrate Women's History Month, I am excited to share this new picture book about her struggles and accomplishments with my students. "It's almost as if Wangari Maathai is still alive, since the trees she planted still grow. Those who care about the earth as Wangari did can almost hear her speaking... Wangari encouraged many village women. She dug holes with them in the red soil--holes in which to plant hope for today and forests for tomorrow." 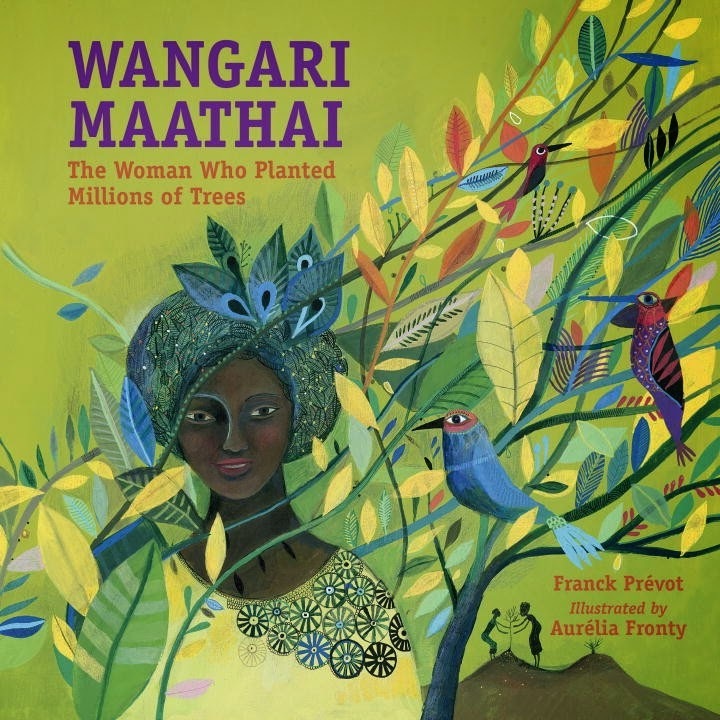 As Prévot tells Maathai's story, he emphasizes how her childhood and her education shaped Wangari, especially, in a time when very few African women went to school or learned to read. 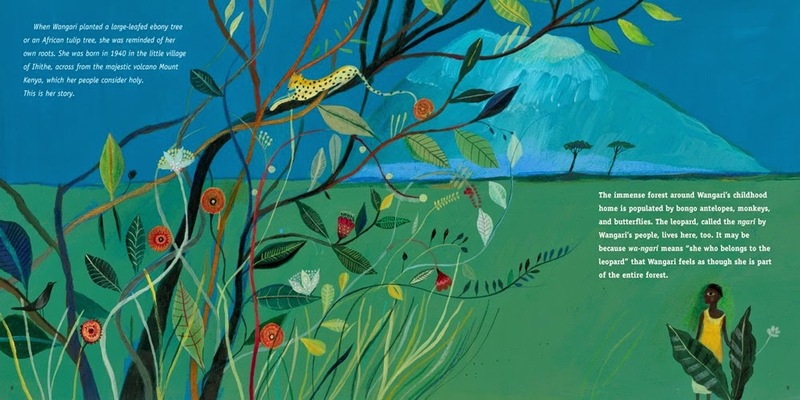 "When Wangari planted a large-leafed ebony tree or an African tulip tree, she was reminded of her own roots." "The government officials who built their fortunes by razing forests try to stop Wangari. Who is this woman who confronts them with a confident voice in a country where women are supposed to listen and lower their eyes in men's presence?" "Wangari believes confident women have an important role to play in their families, their villages, and on the entire African continent." This is truly an outstanding picture book biography. 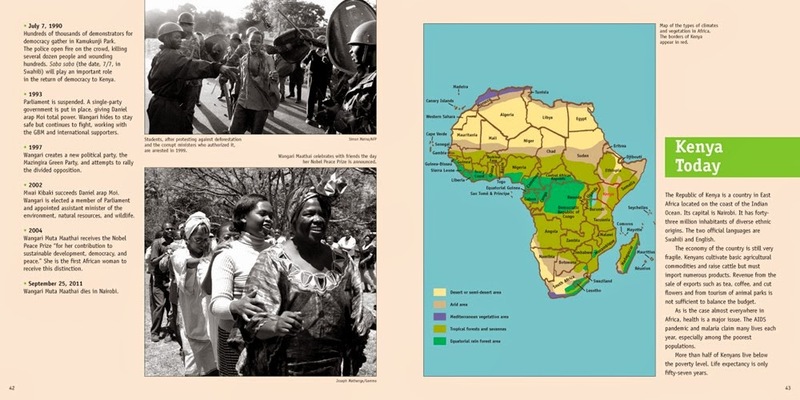 Prévot finishes with a detailed timeline of Maathai's life, illustrated with several photographs. This background material is both easy to access, written in short chunks, but also detailed to give a rich picture of her struggles and achievements. Illustrations ©2011 by Aurelia Fronty; originally published in France. Used with permission from Charlesbridge. The review copy was kindly sent by the publisher. If you make a purchase using the Amazon links on this site, a small portion goes to Great Kid Books. Thank you for your support. I adore picture books for the way they let us escape into our imagination, but they can also help us recognize our resilience (and our children's) as we face disappointment. 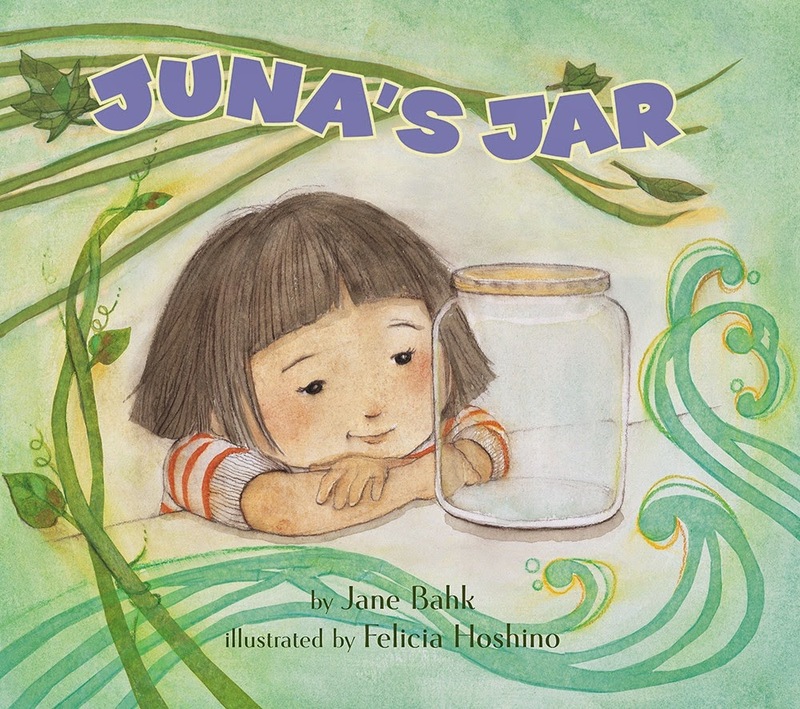 Share Juna's Jar, a lovely new picture book by debut San Francisco author Jane Bahk, and talk with your children about how Juna's imagination helps her when she misses her friend Hector. Juna and Hector always loved collecting things together and putting them in Juna's kimchi jar, but Juna is at a loss when Hector moves away. It's especially sad that she hasn't had a chance to say goodbye. "Juna loved to take the jar and go on adventures with her best friend, Hector." Her big brother, Minho, helps cheer her up, getting her a fish. That night, Juna dreams of diving into the ocean, swimming with her new fish and looking for Hector. The next night, after her brother gives her a bean plan to fill the jar, she journeys into the rain forest. On the third night, Juna rides a cricket in her dreams, traveling far outside the city to Hector's new home. As she sees him sleeping, Juna is able to whisper goodbye. Felicia Hoshino's gentle watercolor illustrations capture Juna's wistful emotions, full of longing but also the final promise of new friendship. Juna's Jar "asks readers to think about friendship, family and the potential of imagination. It's not about looking at life as a glass half full or not but what can happen when we fill the glass." Jane Bahk won the 2010 Lee & Low New Voices Award for an unpublished author of color, with the manuscript for Juna's Jar. I look forward to more stories from her! I also want to honor and thank Lee & Low for this important award.